Undergraduate and graduate students of the Dept. of Education won young scholar awards in the student sessions of the 2018 International Conference for Media in Education held at Chungbuk National University. 41 posters were submitted to the competition sessions and five of them were selected as having the best student papers. Each student presenter received an award certificate presented at the Awards Ceremony on August 17. 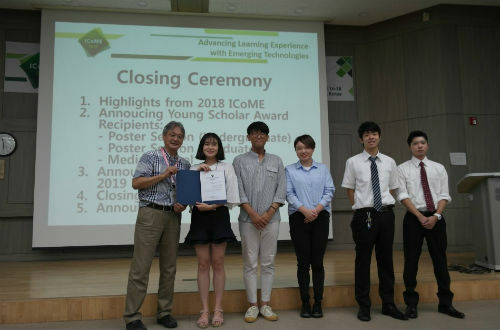 Two undergraduate students, Kim Chae-yeon and Jeong Mu-seok who won the prize collaborated with three Japanese students of Nihon Fukushi University which has an international exchange with CNU. Jeong Mu-seok (Junior, Dept. of Education) said he was so proud because it was his first time to get a prize in an international academic competition. “We tried our best with a professor and staff in our laboratory called ‘Cognition and Education Engineering Laboratory’ and this made our prize much more meaningful,” he added.